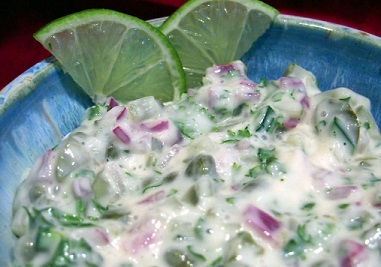 This Cilantro Lime Tartar Sauce will enliven the seafood you serve. 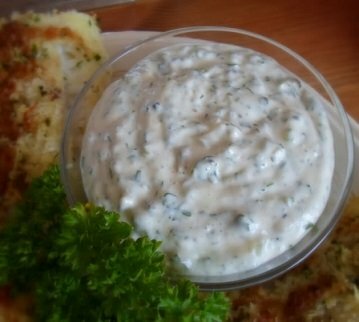 Regardless of how simply you prepare your seafood, this tartar sauce will make it very special. You and your guests will rave about it. 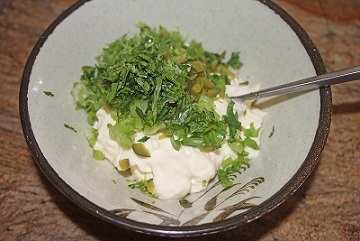 This tartar sauce recipe is good with crab, shrimp, halibut, cod - almost any seafood. This sauce recipe will also enhance some pork and chicken dishes. You will even love it with fried potatoes, warm tortilla chips and even potato chips! This is a really easy tartar sauce recipe but after you try it, you may be preparing it quite often. The restaurant guests and my family like it with bay shrimp and peel and eat shrimp. For those of you who want some extra "zip," leave some or all of the jalapeno seeds in the sauce. Now I've made myself hungry! Let's make some! Preparation time: 15 minutes. Makes about 1 1/2 cups. Enjoy your fabulous tasting Tartar Sauce and the company of those you share it with! Did you know? Cilantro is mentioned in the Medical Papyrus of Thebes written in 1552 B.C. and is one of the plants which grew in the Hanging Gardens of Babylon.